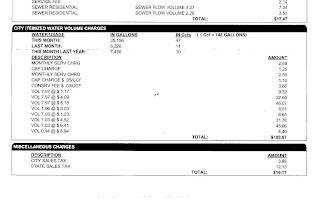 We got our water bill yesterday, and boy did it shock and amaze. Normally, we get a bill for around $50-70, based on if Luann (over)waters the "grass". Even with the extra person in the guest house, the bill stays in its range nicely. This month, however, was way out of line. Instead of the usual amount, it said "$256" !?!?!?! There is no way that is correct. Mostly because we had a $600 bill four or five years ago that was a simple miss reading. So I go out to check the meter (in the rain no less), and sure enough, not only was it correct, but it had already gone 14 Ccfs (cubic feet) past the last reading. Holy guacamole, Batman! I could see it going quite fast around and around, so I immediately started checking the outside water access points to see what the problems was. All was just fine. So I shut off the water to the guest house, and sure enough, the meter stopped advancing. I run to get the keys to the guest house, and see that there is no standing water anywhere, so good thing there. Then I turn the ware back on and hear the noise: the toilet is running. Not only is it running, but it is running quite fast. With three easy turns of the screwdriver, the water is at the correct level in the tank, and no more fast flowing water. Three seconds of work cost me $200 bucks. Darn it.